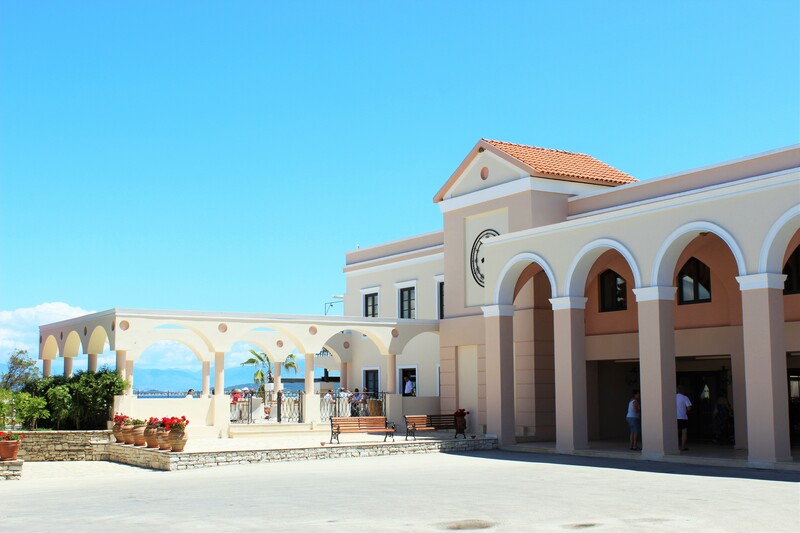 We stayed at the beautiful Roda Beach hotel in Corfu last month and had a fantastic time so I thought I would put together a proper review which might be useful for anyone thinking about booking a holiday to Corfu soon. The pools are amazing at the resort, there are lots of them and the main one is huge. The kids loved the children’s pool which had a couple of slides for them to play on too. There were also smaller pools dotted around near the accommodation, which were great for anyone wanting a quieter swim away from the busyness of the main pool area. There was also a little playground area for the kids, which they absolutely loved and we spent plenty of time there when they weren’t in the pool. The hotel has it’s own spa, which unfortunately I didn’t get a chance to use but from what I saw of it, it looked really lovely. The hotel has it’s own kids club which is for children aged 4 onwards, we didn’t actually use this club as there was also a Thomas Cook kids club, which we used itstead. I’d definitely recommend the Thomas Cook kids club, our kids loved it! One of the sessions that they went to was a chocolate party, yep, a chocolate party, which basically meant they painted chocolate all over themselves and were absolutely covered in it by the time we picked them up! Messy for us, but they loved it. Watersports centre opposite at Roda Beach about 500m distance, offering water-ski, jet ski, paragliding, banana boat, catamaran sailing, sailing, etc. The only thing I would say is that on the days that we had bad weather, there wasn’t anything to do inside. But, then I guess that would be the same at many holiday resorts! 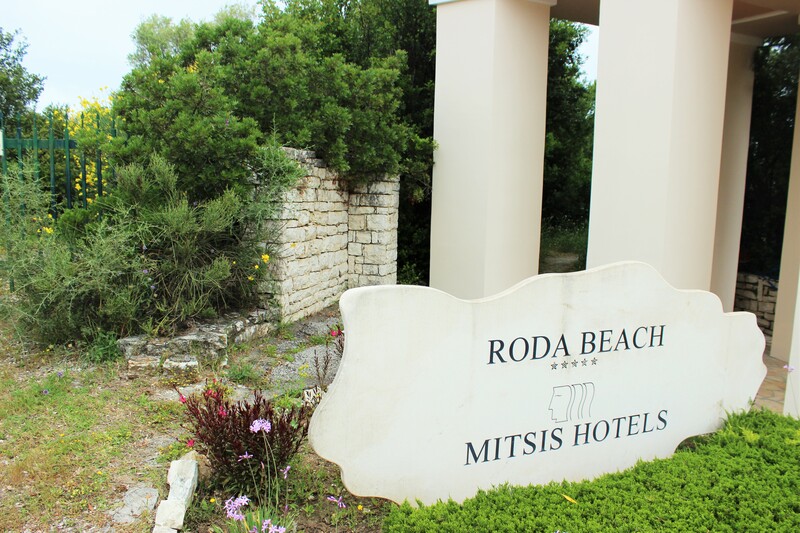 The hotel is located in the town of Roda which is situated on the north coast of the island. It took around 45 minutes in a taxi from the airport to the hotel and cost around 50 euros, so not too bad. We opted for a taxi as it was much quicker than it would have been if we’d gone on the airport transfer coach. The walk into Roda itself, from the hotel was about 10/15 minutes which was a nice walk for me and my husband but the kids being kids, weren’t really up for the walk! In hindsight, we could have just got a taxi from the hotel instead, which would have only taken a few minutes and a few euros. The room itself was nice, with a lovely terrace area to sit out on. The main area was were we slept and then there was a separate room with two single beds for the kids. The bathroom was really nice, with a huge bath! My only issue with the bathroom was that the shower screen kept leaking which resulted in the whole bathroom floor getting wet whenever anyone had a shower. We never actually mentioned this to the hotel staff though, we maybe should have mentioned it and given them a chance to rectify the problem. Another gripe with the room was that we had paid extra for a ‘swim up’ up room, which basically should have meant that we had a gate from our terrace straight into the pool. If you look at the bottom right photo above you’ll see the room next to us, and the room opposite got exactly that, but the pool was actually a few metres away from our room. Not exactly a huge issue, but not what we paid for never the less. The main restaurant was very spacious with an amazing view out over the hotel and the sea. The main restaurant was buffet style dining which was fine but could get a little hectic at busy times. The food was good, with plenty to choose from, there was always something that the kids fancied despite them being really fussy. There were three other restaurants down on the beach front; Greek, Italian and Chinese. These restaurants were much smaller and required booking in advance. We tried them all and loved them all, my favourite being the Italian restaurant. I’d definitely recommend trying all of these restaurants and booking your tables as soon as you arrive to avoid disappointment. There was a creperie down by the pool which was open all day until the early hours of the morning, serving fresh, homemade crepes which were A-MAZING! The bars were located by the pool, at the beach front and two bars in the main hotel building, all serving a variety of drinks and snacks, which we took full advantage of given that we were all inclusive! Lunch baskets are also available for anyone leaving the resort for the day. Free wi-fi was available in reception but it was pretty slow, especially on the day it rained as everyone was packed into the reception area trying to use the internet to pass the time! There were lots of other services available, as listed below, but most we didn’t need to use. In conclusion, I would definitely recommend this hotel, especially to anyone with children as the kids club, food and pools were all ideal for them. I would give this hotel 4 out of 5 as overall it was brilliant but the ‘swim up’ room and the leaky shower screen mean it loses a point for me. looks like a lovely place to go and stay! and a chocolate party….I think I would have wanted to go along to that myself!!! What a fab review-brilliant for anyone wanting to stay there, or in the area! Like others have mentioned, it really is a shame about the swim-up room-I would’ve been quite cross to have paid for that and not got it!! And lack of indoor rainy day activities is always tricky when you’re trying to entertain small children! But I was sold by the all inclusive drinks and snacks!! I would have to resist the urge to drink cocktails all day!! And the chocolate party sounds awesome! The pools look brilliant, really inviting! I’m glad that overall you had a really good time, we are going to brave going abroad with ours for the first time next year, so I will keep this in mind!